Originally, the memories were published as Hemyock&apos;s Memories of War, a 65 page, A4 printed booklet, illustrated with many photographs. All profits went to the Royal British Legion. Now edited & republished in electronic format on Kindle , to raise funds for Hemyock&apos;s Blackdown Support Group Charity, which does so much to help frail & elderly residents. The complete original text in Volume 0 is equivalent to about 135 A5 pages. The entries have now been re-arranged in alphabetical order, by surname; linked from the contents list. At the back of the book, there is a list of the participants and local people mentioned in their accounts. The original photos & images have been made into four HD slideshows and uploaded to YouTube. Volumes 1, 2, 3 & 4 contain themed, edited, illustrated extracts from Volume 0. Volume 5 is a complete Box Set containing Volumes 0, 1, 2, 3, & 4. This series of books can be read on any Kindle device, and also in the free Kindle reading apps that Amazon offers for PCs, tablets and smartphones. Kindle now also offers a free online Kindle reader, which works within most web browsers. Kindle Volume 5: Complete WWII Box Set. 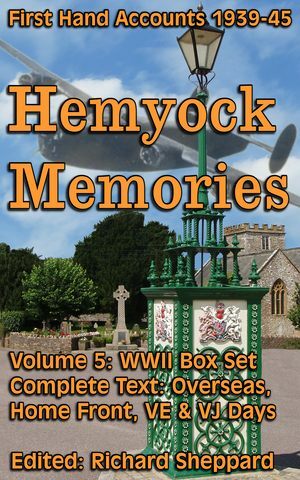 The complete WWII "Box Set," Hemyock Memories Volume 5, contains all the WWII volumes 0, 1, 2, 3, 4 covering life during World War II 1939-45. These Memories of WWII Kindle books contain eyewitness accounts by residents of Hemyock, of their life during WWII, both serving overseas and on the "Home Front." Kindle Volume 0: Complete Text Version. Volume 0 contains the complete text in alphabetical order, with over 75 first-hand accounts, plus the full list of names. Kindle Volume 1: Illustrated, Edited Excerpts. Illustrated edited excepts: Dunkirk 1940, D-Day 1944, Surrender of German U-Boat Fleet 1945. Kindle Volume 2: Evacuee Children, The Home Front & Women&apos;s War Work. Illustrated edited extracts. Many of these stories were written by women and are about wartime life for women; including working in new roles, replacing men who had been sent overseas to fight. Kindle Volume 3: WWII in Europe & North Africa. These edited extracts cover many of the campaigns, including the long bitter struggle after the D-Day landings in June 1944 until Europe was finally liberated on 8th May 1945, VE-Day. Kindle Volume 4: WWII in Royal Navy, Convoys, Burma & The Far East. These edited extracts cover the Arctic, to the tropics and the steamy heat of Burma; then on to witnessing the Japanese surrender in Singapore and release of the prisoners of war, after VJ-Day on 15th August 1945. Links to Video Slideshows of Original Photos. For convenience, the more than 130 photos from the original book have been arranged in four groups, forming four slide shows, each lasting about four minutes. The slide shows have been uploaded as 1080p HD. This means that they can be viewed using most types of computer or mobile devices and at any of the resolutions supported by YouTube. Contact us for a DVD version of these slideshows, or versions in other formats. Links to Videos of Excerpts. Several edited excerpts are available on YouTube. These use automated text-to-speech software to read the text aloud, while the text scrolls slowly up the screen. (2 to 5 pm) between Easter and September. Hemyock Castle, Hemyock, CULLOMPTON, Devon, EX15 3RJ, UK.